Let Aqua-Tech create your custom-built outdoor fireplace. Enjoy the perfect area to entertain and stargaze. A great backyard is simply an extension of your home, and what’s a more pleasant and luxurious way to relax than a cozy fireplace? A custom built outdoor fireplace takes this wonderful feature and places it outside. 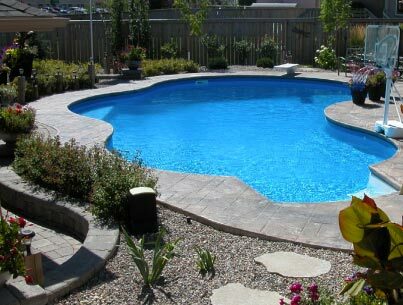 Bringing together your swimming pool, hot tub, landscaping or any other backyard features to create a stunning gathering place is something Aqua-Tech does best—let us create yours. Having Aqua-Tech design and build your outdoor fireplace means that you’ll get a quality of service that you won’t find elsewhere in Winnipeg. With an Aqua-Tech installation, you’re not just getting a run of the mill build. You’re getting the opportunity to transform yours into a new backyard and create the incredible space you’ve been dreaming about. Your outdoor fireplace can be created with wood or gas in mind, and designed to provide as much warmth as you want. Every fireplace is completely unique, so you can dictate to our designers exactly what would make your outdoor fireplace the perfect gathering place and we’ll make it possible. You can choose electronic controls, customized glasswork, dimensions, material and so much more. The people in the crew were friendly and co-operative doing excellent work and cleaning up the jobsite as well. As in my past experience, Aqua-Tech has again done a first rate job. I look forward to referring your company to friends and acquaintances. Only Aqua-Tech’s talented designers and skilled installers can create an outdoor fireplace that is a functional, elegant addition to your space, beautifully complementing your property while satisfying your requirements. Our project manager will over see the entire process so that your only responsibility is to sit back and relax. 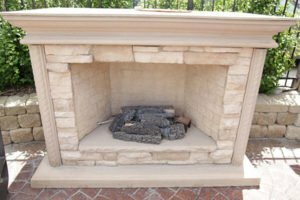 Don’t wait any longer to begin working with us on your perfect outdoor fireplace. Get in touch today! Request Your FREE Consultation With An Outdoor Living Designer! Discuss your backyard vision, discover how we can make your backyard dreams a reality, get answers to your questions and more!